The number of Americans hearing mostly bad news about the nation’s economy continues to decline. Three-in-ten (30%) now say they are hearing mostly bad economic news, less than half the number that said this in early August (67%). The percentage saying they are hearing a mix of good and bad news about the economy has doubled since the summer (30% in August to 60%), according to the latest weekly News Interest Index survey, conducted Jan. 5-8 among 1,000 adults by the Pew Research Center for the People & the Press. Relatively few (9%) say they are hearing mostly good news about the economy. Still, that number also has grown in recent months. The survey finds that the 2012 presidential campaign was the public’s top story last week, though news about the economy was not far behind. About a quarter (27%) say they followed news about the elections most closely; 19% say this about the economy. The battle for the Republican presidential nomination received far more coverage than any other story, according to a separate analysis by the Pew Research Center’s Project for Excellence in Journalism (PEJ). News about the Iowa caucuses and the shifting fortunes of the candidates accounted for 52% of the week’s coverage. The campaign made up a comparable share of coverage in the same week in 2008 (49%), though that year both parties had high-profile contests for their nominations. Nearly four-in-ten (37%) say the 2012 campaign has gotten too much coverage, while about as many (39%) say news organizations have given the campaign the right amount of coverage. Another 16% say the campaign has gotten too little coverage. In January 2008 – just after the Iowa caucuses and before the New Hampshire primaries – opinion was similar: 40% said news organizations were giving the campaign too much coverage, 43% said they were giving it the right amount and 11% said too little. 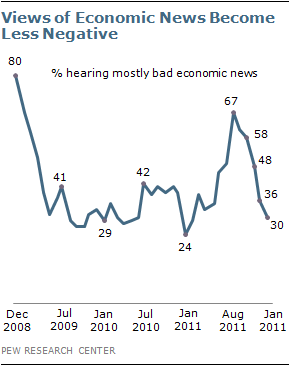 Republicans, in particular, are expressing less negative views of economic news than they did just a few months ago. Currently, just 33% of Republicans and Republican-leaning independents say recent news about the economy has been mostly bad, down from 45% in December and 72% in October. Democrats’ perceptions of economic news, which were far less negative than Republicans’ views in recent months, also have improved. 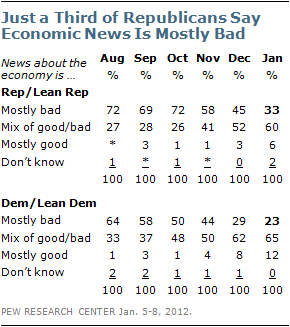 Currently, 23% of Democrats and Democratic leaners say recent economic news has been mostly bad, which is only a slight decline from December (29%) but fewer than half the number that viewed the news as mostly negative in October (50%). Since October, the percentage of Democrats and Democratic leaners saying they are hearing mostly good news about the economy has jumped from 1% to 12%. With Iowa caucus-goers casting the first votes of the 2012 campaign on Jan. 3, 27% of Americans say the presidential election was their top story of the week, more than any other story. Still, the percentage following election news very closely is about where it was in mid-December. About three-in-ten (29%) say they followed this news very closely last week; 26% said this in a Dec. 15-18 survey. So far, the patterns in interest and coverage are similar to the build-up four years ago. In 2008, with hotly contested campaigns in both parties, interest and coverage spiked in the early months of the year as those battles played out. Not surprisingly, Republicans are following the latest developments much more closely than Democrats or independents. Four-in-ten Republicans (40%) say they followed election news very closely last week, compared with 27% of Democrats and 25% of independents. This same week four years ago, Democrats were more engaged. Barack Obama had won the Iowa caucuses and was battling Hillary Clinton in New Hampshire; 41% said they were following the campaign very closely, about the same as the 36% of Republicans that said this. Among independents, 27% said they were following campaign news very closely. Overall, perceptions of whether there has been too much coverage of the campaign are little different from four years ago at this point. However, fewer Republicans see the campaign as over-covered than did so at this point four years ago, while Democrats are more likely to say the campaign has received too much coverage. Currently, 30% of Republicans say the campaign has received too much coverage while 46% say the amount of coverage has been appropriate; 18% say the campaign has gotten too little coverage. In January 2008, 45% of Republicans said the campaign was getting too much coverage, 41% said the right amount, and just 7% said the campaign was getting too little coverage. By contrast, more Democrats now say the campaign is getting too much coverage than did so four years ago, amid extensive coverage of the nomination contest between Obama and Clinton (4% now vs. 32% then). Just 38% of Democrats say the current campaign is getting the right amount of coverage, down from 50% in January 2008. Though the campaign was the public’s top story last week, Americans also continued to track news about the nation’s economy closely. With a positive federal jobs report released Friday, 39% say they followed news about the economy very closely. Interest in economic news has hovered around this level for much of the past year, fluctuating only slightly. By comparison, 29% say they followed election news very closely. 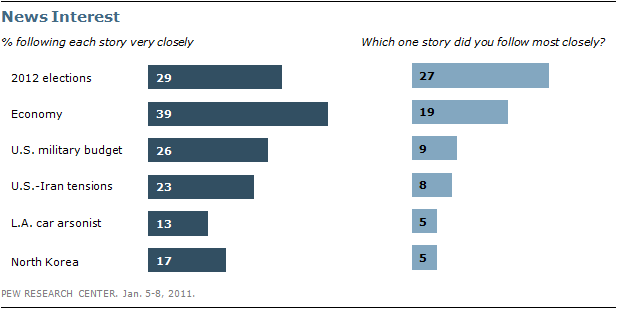 About two-in-ten (19%) say they followed news about the economy more closely than any other story. Last week, news about the economy accounted for 8% of coverage, according to PEJ. About one-in-ten (9%) say their top story was the Obama administration’s new plan to change defense strategy and reduce military spending; 26% say they followed this news very closely last week. 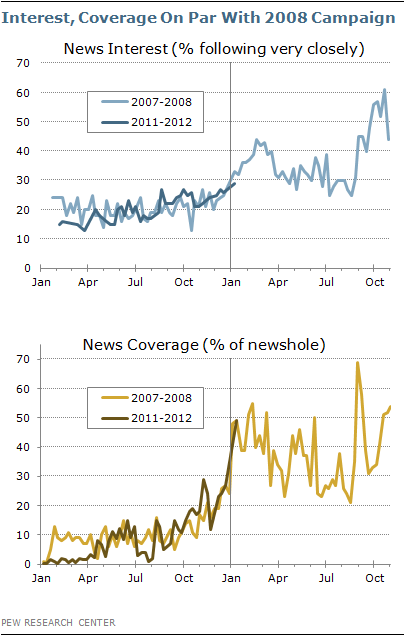 News about the new strategy made up 3% of the newshole. Tension between the U.S. and Iran over shipping in the Persian Gulf was the top story for 8%. Nearly a quarter (23%) say they followed this news very closely. Republicans are more likely to say they followed these developments very closely than are Democrats (29% vs. 19%); 23% of independents say this as well. 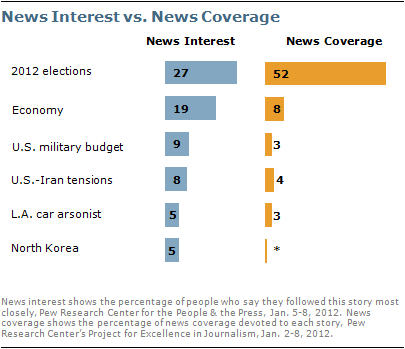 News about Iran more generally accounted for 4% of coverage. News about the leadership changes in North Korea attracted modest attention and little coverage last week. Following the December death of Kim Jong-il, his son, Kim Jong-un took control of the country’s government. News about the situation in North Korea was the top story last week for 5%, while 17% say they followed the situation there very closely. News about the changes in North Korea accounted for less than 1% of coverage last week. Another 5% say their top story was news about the arsonist in Los Angeles who apparently set fire to more than 50 automobiles; 13% say they followed this news very closely. News about the fires and the man arrested by police as the suspected arsonist accounted for 3% of coverage. These findings are based on the most recent installment of the weekly News Interest Index, an ongoing project of the Pew Research Center for the People & the Press. The index, building on the Center’s longstanding research into public attentiveness to major news stories, examines news interest as it relates to the news media’s coverage. The weekly survey is conducted in conjunction with The Project for Excellence in Journalism’s News Coverage Index, which monitors the news reported by major newspaper, television, radio and online news outlets on an ongoing basis. In the most recent week, data relating to news coverage were collected Jan. 2-8, and survey data measuring public interest in the top news stories of the week were collected Jan. 5-8 from a nationally representative sample of 1,000 adults.